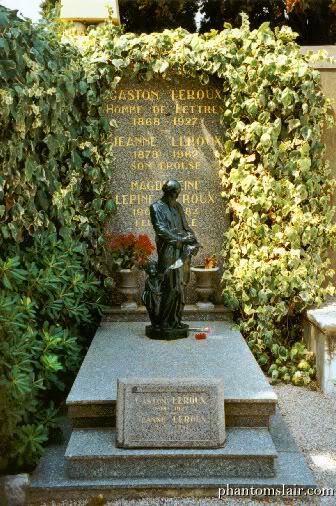 I'll be in Nice, France on May 16th, and I understand that Gaston Leroux's was buried there. Does anyone have any info on exactly where his grave is located and any advice/info for travelers if you've been there before? The graveyard is up on a big mountain. I don't remember the name of it now, but I'm sure Scorp does. The actual grave itself was really easy to find. It's just to the left of the graveyard's entrance. Then you have the house where he lived of course. I believe the street is called "Boulevard Gambetta" but I can't remember the number. Scorp? Phantomlove wrote: The graveyard is up on a big mountain. I don't remember the name of it now, but I'm sure Scorp does. The actual grave itself was really easy to find. It's just to the left of the graveyard's entrance. The cemetery is on a big hill and is called Cimetière du château (I assume because a castle must have stood on the hill at some point?). It shouldn't be too difficult to find. My suggestion would be to ask at the tourist office in town. (I went seven years ago so my memory of what the street was called to get there is sketchy). Leroux's last residence in Nice (with a plaque on the exterior wall) can be found at 53 Boulevard Gambetta. At first I thought this was where he wrote Phantom, but further research indicates he didn't, sadly. All I know is that he wrote Phantom in Nice in the area called Mont Boron (then he moved to the house at Boulevard Gambetta). But I don't have the address of the property in Mont Boron; still haven't found it. Maybe it'll turn up in the archives at the Bibliothèque nationale in Paris; planning on doing another raid on them in June. Scorp, thanks for posting all this really great info. The photo of Leroux's grave is particularly wonderful. Is the bronze statue of Gaston himself or of other family members? Visited Leroux's grave and said a silent "thank you" for writing a story that's brought so much into my life. Didn't take a picture, though, since I saw a giant sign at the entrance that apparently said "no photography" amongst lots of other things they don't let you do. Only a few people around, so I probably could have taken one without any issues, but I'm rather sensitive about photography in churches, cemeteries and the like. But Lil' Erik (aka Plush!Erik) did take a pic outside the cemetery to prove that he did make it all the way there. Raphael wrote: Visited Leroux's grave and said a silent "thank you" for writing a story that's brought so much into my life. This looks very cool - a new attraction opening in Paris where actors role play the city's famous legends, including that of the Phantom. Opening in April. They're recruiting actors now if anyone's interested.